Canmore lies in the Bow Valley, flanked by mountains rising up to 1,000 meters (3,280 feet) above the valley floor. To the south and west are the distinctive peaks of the Three Sisters, Mount Lawrence Grassi, impressive Ha Ling Peak (known locally as Chinaman’s Peak), and the southeastern extent of Mount Rundle. Across the valley are the Fairholme Range, Mount Lady Macdonald, and Grotto Mountain. Like the rest of the Canadian Rockies, these mountains began as layers of sedimentary rock laid down on the bed of an ancient sea. The seabed was forced upward over millions of years to create today’s lofty peaks, whose sedimentary layers give them a distinct appearance. Through the valley flows the braided Bow River, heading eastward and into the Saskatchewan River system. At the north end of town, the river divides in two, leaving downtown Canmore on a low-lying island that is protected from annual spring flooding by dikes of large boulders. Even though much of the valley floor is developed, large tracts of land are protected by Bow Valley Wildland Provincial Park, making the surrounding area a delight for nature lovers. Lowlands on either side of the Bow River are lined with stands of poplar, while the drier mountainsides support extensive stands of Douglas fir, Engelmann spruce, and lodgepole pine. 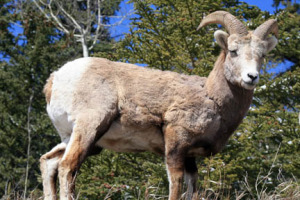 A young male bighorn sheep. The forested valley floor provides habitat for many larger mammals, including around 100 elk, most often sighted on the Canmore Golf Course and along the west side of the Bow River. Other larger mammals present include white-tailed deer, coyotes, black bears, and grizzly bears, all of which are regularly sighted in and round town limits. Bighorn sheep are common on rocky outcrops above Spray Lakes Road and along Highway 1A east of town toward Exshaw. Cougars inhabit the surrounding wilderness but are rarely sighted. Smaller mammals present in Bow River and its adjacent sloughs include a healthy population of beaver, as well as muskrat and mink. Red and Columbian ground squirrels and least chipmunks inhabit the forests around town, while at higher elevations golden-mantled ground squirrels and pikas find a home. Birdlife around Canmore is prolific. Mallard ducks are a popular attraction on Policeman’s Creek in downtown Canmore. Several active osprey nests can be seen along the banks of the Bow River; other permanent residents include great horned owls, jays, and ravens.